They hadn’t even been at the refugee camp a whole day when the first of only two power adapters blew up. Researchers Ryan Fobel, his brother Christian Fobel, Alphonsus Ng and Julian Lamanna had been feverishly working toward this day for months. They’d pulled all-nighters, designed, redesigned and debugged circuits, mixed reagents and buffers, put out literal fires, built their portable lab, taken it apart and built it again. They and their lab mates were still making changes the night before boarding the plane. 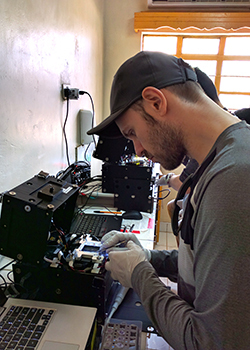 Now the four members of Professor Aaron Wheeler’s Microfluidics Lab — collectively dubbed the “Away Team” — were finally on the ground in a four-room hospital in Kakuma, a camp in remote northwestern Kenya. They were ready to test that their group’s portable lab-on-a-chip could handle running 600 laboratory-quality tests for measles and rubella in less than three weeks. Vaccine-preventable diseases, such as measles and rubella, have long been a threat in the developing world due to low vaccination rates — in 2014 measles killed 115,000 children, and rubella infection among pregnant women can cause fetal death or congenital defects. 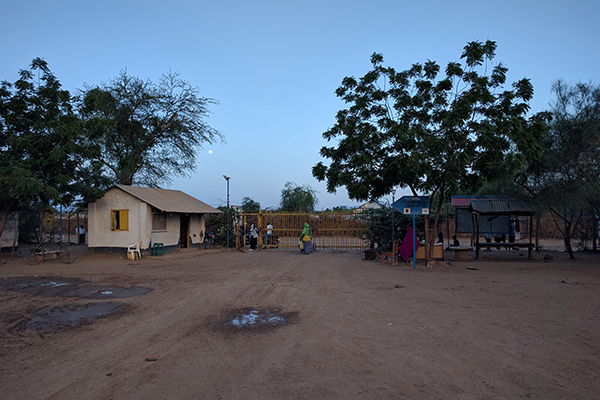 Diagnostic tests for both measles and rubella must be very sensitive, and are therefore usually conducted in remote, centralized labs — not much help if you are a pregnant woman in a refugee camp. With no Plan B, the Away Team was forced to become true health-care hackers, testing the limits of what lab-based research can deliver in the field. Wheeler doesn’t back away from the seemingly impossible. A professor in the University of Toronto’s Donnelly Centre, Department of Chemistry and Institute for Biomaterials & Biomedical Engineering (IBBME), he and his research group are international leaders in the field of microfluidics. Wheeler and his lab are particularly known for their contributions to “digital microfluidics,” a technique used to move, split, recombine and mix miniscule droplets all on a tiny “chip.” The chip is made using some of the same methods for making computer chips, the droplets are controlled by applying electrical signals to different electrodes. This lab-on-a-chip technology allows Wheeler and his students to shrink diagnostic tests that once required rooms full of laboratory equipment down to the size of a credit card. Researcher works in an improvised lab (Ryan Fobel) In 2014, the Wheeler Lab landed a grant from Grand Challenges Canada, in addition to funding from the Natural Sciences and Engineering Research Council, to create the world’s first lab-quality field-deployable diagnostic test for measles and rubella viruses using only finger-prick amounts of blood, and test it in Kenya. The Wheeler Lab dubbed their hackable diagnostic platform the MR Box, pronounced “mister box,” because it tests for measles and rubella, M and R.
To execute on this international deployment, the group teamed up with the Centers for Disease Control and Prevention (CDC) in Atlanta, and the International Rescue Committee (IRC), a non-governmental humanitarian organization delivering aid in Kakuma. 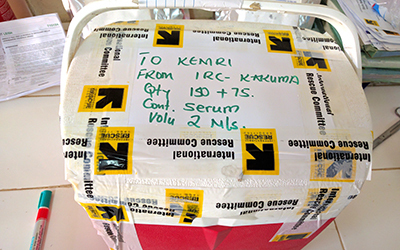 Working with the CDC and IRC, the team made plans to take their MR Boxes to Kakuma at the same time as a massive public measles and rubella immunization campaign. They set an ambitious schedule for themselves. They would test 75 children and 75 caregivers — mothers, community members, etc. — four times each, for a total of 600 individual tests in less than three weeks. 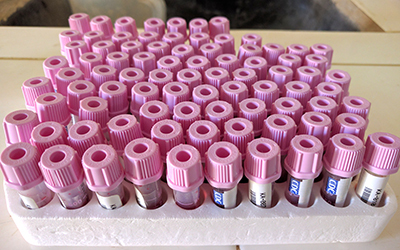 Blood samples (Ryan Fobel) Screening for both diseases separately, they would first test the caregivers, who were expected to have been previously vaccinated and therefore have measles and rubella antibodies. In a second round of tests two weeks later, they would test the children that had been vaccinated, since the antibodies produced in response to vaccination mimic an infectious response. The study was designed to evaluate their tool’s capabilities for both monitoring the rate of vaccine coverage and for identifying disease outbreaks. This would leave them with two days to visit the Kenyan Medical Research Institute (KEMRI) national laboratory in Nairobi, the institution that would test their samples and validate their lab-on-a-chip technology — or not — before returning to Toronto. One week into the three-week field trial, the Away Team was waiting for the remaining samples. Even down to one transformer, all four MR Boxes had held up and they had successfully run 300 tests on blood samples from the caregivers and children. Now public health workers were starting to collect samples from the children after they’d been vaccinated, but these wouldn’t be available to test until the final two days of their testing window. To finish the remaining tests in just two days, they would need to have all four MR Boxes running — they couldn’t afford to have a single thing break. While the Away Team was sweating in Kakuma, a tight-knit crew of at least nine post-doctoral fellows, graduate students and undergrads were back in Toronto, hustling to solve problems as they arose — early in the trip, they had to manufacture and ship a jug of their custom assay solution with a special UN flight after the Away Team’s container leaked on the way over. PhD candidate Darius Rackus was leading the crew. Over the course of improving their platform in preparation for Kenya, Rackus estimates that the group fabricated more than 1,000 chips themselves on campus. Back in the field, it was time for the Away Team to push through the final 48 hours of testing — with half of their tests still to run. They needed to have all four MR Boxes hold up and run at full capacity in order to get through the remaining 300 tests. Ryan’s mind cast back to the night before they boarded their flight to Kenya, when he and Christian had been frantically trying to redesign a circuit that kept going up in flames. They knew then that without having that circuit board working, the team could only run two machines at a time. “We got to the very last component we were testing, and we said, ‘If it isn’t this thing, we don’t know what it is,’” said Christian. They got the circuit working and three weeks later in Kakuma, their hustle was paying off. All four MR Boxes cooperated through that last 48 hours and the Away Team successfully ran the final 300 tests. “If we hadn’t fixed it, I don’t think we would have finished,” said Lamanna. Exhausted but elated, the Away Team left the refugee camp and set out on the long and bumpy road back to Nairobi to deliver their samples to KEMRI. Not only does KEMRI handle all diagnostics for Kenya, it’s also the destination for high-reliability tests from five neighbouring countries. Expecting a state-of-the-art robotic instrument capable of handling an extremely high volume of tests, the Away Team was shocked to find two people at a lab bench, processing tests by hand. 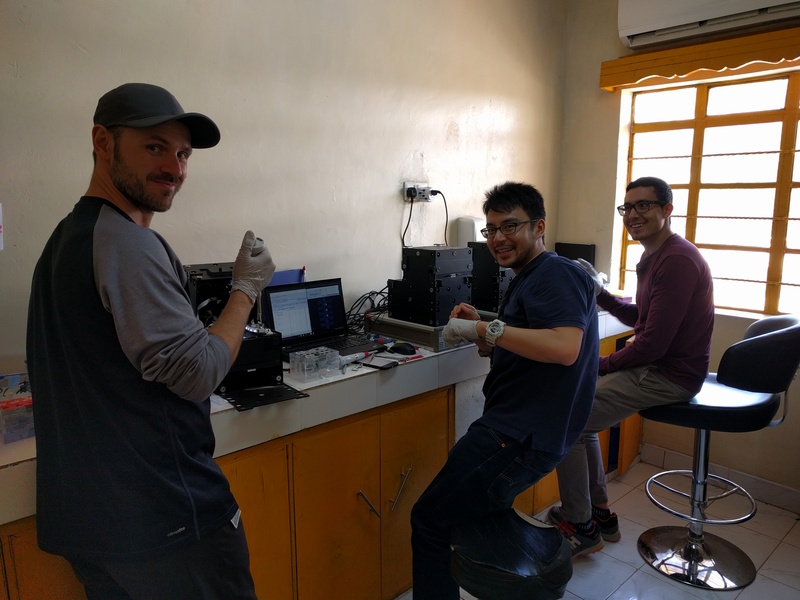 “We were very impressed with the quality of the staff, but to see how limited the resources are that they have to work with, knowing that all the surrounding countries are sending their samples there…it was sobering,” said Christian. With all 600 tests now awaiting comparison against KEMRI’s results, the Wheeler Lab is reunited and working on the next challenge: introducing more automation into their platform. “What we really want is to make the instruments so robust that you can hand them off to locals, who can jump on a motorbike and ride miles into the bush and operate them by themselves off solar power,” said Wheeler. Don’t think they won’t do it.